﻿Published by Sareth Ney on March 3, 2017 at 6:00 a.m. 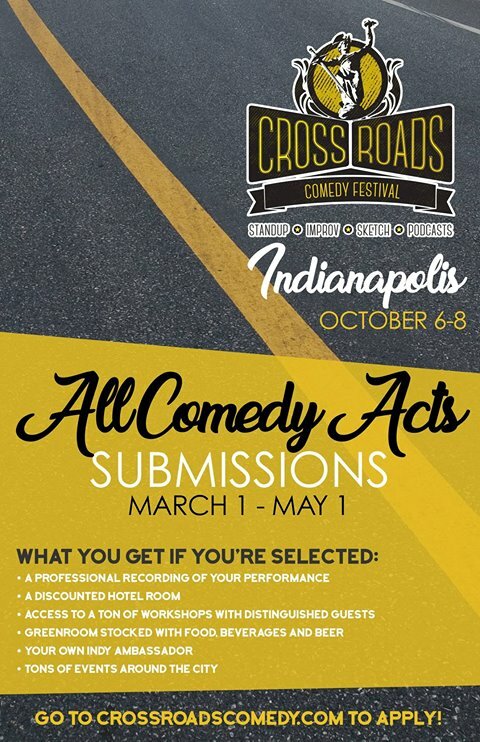 Updated on March 3, 2017 at 9:08 p.m.
INDIANAPOLIS – Crossroads Comedy Festival is currently accepting submissions for 2017. It takes place from Oct. 6 through Oct. 8. The deadline is May 1. Stand-up, improv, sketch and podcasts are being accepted. Those chosen will be notified on June 1 and perform twice. The venues involved will be announced on a future date. Details needed for consideration to take part of the Crossroads Comedy Festival are the following: a link to an unedited video of a recent performance, registration fee of $20 and information filled out on the application. The registration fee increases in two weeks. Information required on the application include: the type of act (stand-up, improv or other), name of the act/performer, contact person, street address, city, state, zip, history, 1-2 sentence description, uniform resource locator (URL) of photo, URL of video, Twitter handle, Facebook URL, email address, phone number and website. Registrations will be linked to the email address submitted and applicants are encouraged to use the same for both. Tickets to attend individual shows at Crossroads Comedy Festival can be purchased 30 minutes prior to the performances. They will be sold at $5 each and will only accept cash. Festival passes can be purchased online or any day during the festival. A working link will be mad e available soon. One lodging option for Crossroads Comedy Festival can be made with Nikki at Indy Hostel. To make reservations, she can be reached at (317)-727-1696. Volunteers are also needed and inquiries can be directed to bill@indyimprov.com. There will be a block party, prior to the festival. It takes place in the spring and is presented by RAD SUMMER. Flat 12 will be providing the beer and food trucks will be on site. Funds from Crossroads Comedy Festival will be raised for the non-profit organization, INDYPROV. They have risen over $40,000 for other organizations; gives back to their communities and produce comedy shows throughout the city. They have set up workshops for Mary Rigg Community Center and The Autism Center of Indiana. Main stage sponsors of Crossroads Comedy Festival are Flat 12 Bierworks and INDYPROV. Stage, producer, media and radio sponsors are to be announced. Friends of the festival are Indy Pride and Zach Rosing Productions. To become a sponsor—reach out to festival director, Bill Skaggs. His email address is info@crossroadscomedy.com. His mailing address is 902 N. Meridian #115 Indianapolis, IN 46204. His phone number is (317)-721-3001.